There have been many occasions in my life and most likely yours, when I needed to refer to a dictionary. I remember when I was a kid I always asked my mom what a word meant or how it was spelled. As I recall, most of the time she would say to me, "Use the dictionary." She wanted me know what the words meant for myself and to rely on the dictionary as a constant resource for my spelling needs. As an adult you'd think I'd stop asking what something means or how it was spelled, but I've found as I search the scriptures that there is always a use for a regular or a Biblical dictionary. It is amazing what you'll find as you refresh your memory of a spelling or a definition. "Patient - Enduring affliction or pain without anger or complaint." I don't know about you but as a Christian that definition really hits you with a reality check in a huge way. First off, it made me think of the patience with which our Savior endured the cross and all the things He went through to get to the place where they crucified Him. The agony and long suffering that the Savior endured in order to fulfill the great plan God had for the way of Salvation of mankind! Here I stand convicted! Referring to our Lord and the definition above, I obviously don't know what patience really is and I definitely don't know how to be patient. I've got a lot to learn, as I believe each one of us does. Think about it: when we reflect on all He endured in His life up to the cross, everything He went through makes our attempt at patience a cakewalk. I'm not saying that there isn't real suffering in our lives but in comparison it's mild in view of our Savior's life, His crucifixion and affliction. What an example He was and is still today for all mankind! Sometimes I think we believe patience is merely waiting in a long check-out line that's cash only, ten items or less, while someone at the front of the line unloads their basket of well over ten items on the conveyor belt and tries to use their credit card. Or maybe we're in rush hour traffic and some driver decides to merge into your lane when there's seemingly only about a half a car length to do so. I kid about this but please don't get me wrong, I know from experience that this does take patience, but it's not necessarily at the same level that we'll learn as we are growing as disciples of Jesus Christ. The goal however, is to apply the principles we learn about true patience as seen in the example of the life of our Savior. Good Friday, Resurrection Sunday (AKA Easter), offer us wonderful opportunities to remember all the Savior accomplished for us so we might know Salvation and that we're able to have an eternal relationship with and fellowship with the Creator of the universe. Any day whether an observed holiday or not, let us never grow complacent or un-thankful for the saving work of Jesus Christ. Let us never stop learning about Him and the true patience He has modeled for us. I'm thankful that Jesus sent His Helper The Holy Spirit to help us grow in The Fruit of The Spirit including patience! As a personal application I would encourage you to stop right now and take stock of what Jesus did for you individually so we were able to know His salvation. Think about your own salvation. It's humbling isn't it?! When you think about all He did for you personally and possibly all He brought you through to the point where you were finally at the end of yourself willing to receive Him and give your life over to Him. Stop and thank Him for all He has done for you. Today He waits patiently for the appointed time of His return and so do we. I pray that we'll all be ready. 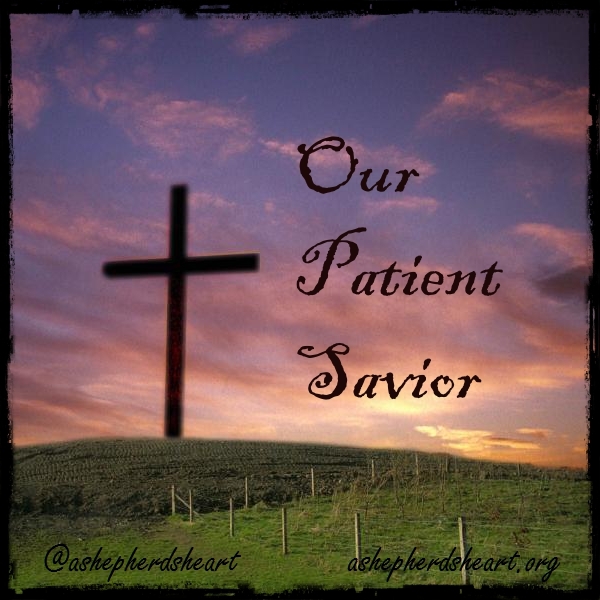 Make no doubt about it- He knows what being patient is because He is - Our Patient Savior. -What did Jesus do for you and for mankind? 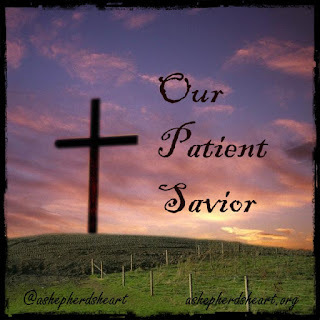 -Does this definition of the word "patient" make you look differently at the scriptures that use this term or the term patience? -How does it make you view the Savior? -Do you thank the Lord for what He endured for you? -Does it make you want to serve Him more? -Is He an example to you of how you should endure affliction, etc.? PS. If you don't know Jesus a your Savior, please check out this post that is a tool which will help you understand how He's drawing you to His free gift of Salvation! Great ideas Mr. Koch! Thank you for laying out the virtue of patience so clearly!